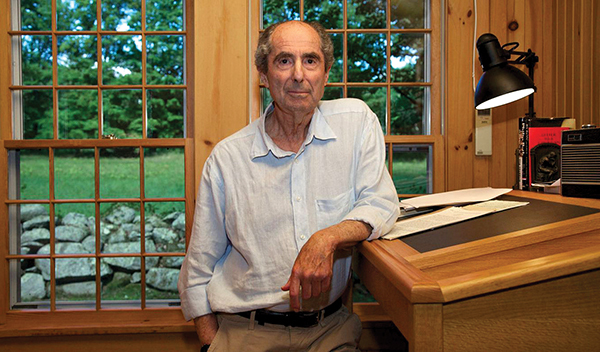 Philip Roth at his Connecticut home. JUNE 7, 2018 – Reading Philip Roth taught me how to write fiction. Reared, like Roth, on the so-called classics – i.e., works of fiction by white male authors, the majority of them Christian – and introduced at Concord Academy to the more diverse voices of Amy Tan, Toni Morrison, Virginia Woolf, and Jean Rhys, I managed to arrive at college with no clue as to what a Jewish voice, male or female, might sound like on the page. It wasn’t until graduate school, which I entered after ten years as a professional journalist, that I first read “The Counterlife” and had the Roth epiphany that so many writers, Jewish ones in particular, describe in the awestruck terms of religious awakening. As if, for the first time, they are meeting themselves on the page, and the person they find there is far more eloquent, ribald, and witty than anyone has thus far acknowledged them to be. In that sense Roth is, was – he died May 22 at the age of 85 – the great liberator. His voice, so singular in its forthrightness and unapologetic embrace of filth, lends contemporary novelists the permission to explore the parts of themselves and therefore the aspects of their characters, they may otherwise have deemed too depraved or unseemly for public consumption. Had Alexander Portnoy, the horny antihero of Roth’s seminal 1969 novel, “Portnoy’s Complaint,” not defiled that now-infamous piece of liver, we might never have had the pleasure of reading “Fear of Flying,” Erica Jong’s classic feminist roman à clef of female sexual liberation. “Sabbath’s Theater” by Philip Roth. Boston: Houghton Mifflin, 1995 (First edition). Cover by Milton Glaser. While Roth’s preoccupation with the male organ and its attendant needs – never mind his flimsy portrayals of female characters – has led some feminist critics to label him a mysogynist, it’s his male characters who suffer the most. Mickey Sabbath is as flawed and pathetic a man as one can imagine – and yet, for those like me who admire “Sabbath’s Theater,” we love him. Or at least pity him. It’s Roth’s ability to paint characters who in life we’d probably want to strangle as worthy of our attention in the fictional world that has won him so many followers – and awards. 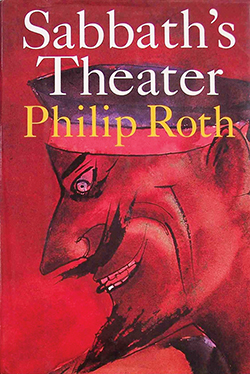 “Sabbath’s Theater,” in fact, won the 1995 National Book Award, and female writers such as Claire Messud have called it their favorite of Roth’s works, precisely for its irreverent and humorous portrayal of such a feckless human. In this age of trigger warnings and sensitivity readers and Twitter mobs that attack both with and without legitimate cause, Roth stands out as uniquely impervious to the stultifying constraints of political correctness. His fiction is not one of rules or politesse; it is, rather, a bold rejoinder to what society deems holy. When his short story, “Defender of the Faith,” was first published in The New Yorker in 1959, it drew squealing cries of protest from offended American Jews, the rabbis in particular, who saw it as a shanda, a disgrace, that a Jewish writer would cast a Jewish character in such an unflattering light. 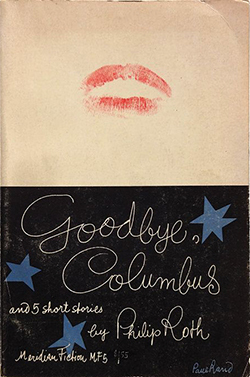 In the story, later published in Roth’s first collection, “Goodbye, Columbus” – which also won him his first National Book Award in 1960 – a US Army private by the name of Sheldon Grossbart manipulates his Jewishness for personal gain by appealing to his sergeant, a fellow Jew, for special favors. Grossbart asks, for example, for a pass to leave the base and visit his aunt in St. Louis for a Jewish holiday, which turns out to be a ruse, and in a final act of bad faith, he asks the sergeant to spare him being sent to the Pacific to fight Japan. “Goodbye, Columbus” by Philip Roth. Meridian Books, 1960 (First edition). Cover by Paul Rand. Roth’s later works continued to grapple with Jewish identity, but as the writer matured, so too did the tenor of his voice. In his 1997 masterpiece, “American Pastoral” – which garnered him a Pulitzer – Roth’s fictional alter ego, Nathan Zuckerman, narrates the imagined life of Seymour “Swede” Levov, a former star athlete from Newark whose picture-perfect family disintegrates in the late 1960s as his daughter, Merry, joins a Weather Underground-style terrorist cell and kills a man in a bombing she helps to coordinate. As with “The Counterlife,” which explores Zuckerman’s relationship to Israel and his brother’s sudden decision to abandon his family in New Jersey and join a religious settlement in the West Bank, Roth examines political extremism and the foundering of the American Dream. Gone are the histrionics and provocations of his earlier works, but the books are no less readable. Roth maintains his ability to draw aggrieved and pain-ridden characters, disillusioned by the promise of America, and struggling to find their place both as Jews and human beings in an unjust world. The Zuckerman books, which total nine, also gave Roth an opportunity to address the personal indignities of aging. In “Exit Ghost,” his 2007 novel that serves as a sort of coda to his first real Zuckerman book, “The Ghost Writer,” Zuckerman decamps from the Berkshires to New York City for an operation that might cure his incontinence. As he walks the city, encountering characters from his past, and meeting a young couple who want to swap houses, he is once again confronted with the lust of his youth – but now, impotent and incontinent, he has no way to relieve it. Roth famously rejected the label of a Jewish-American writer, insisting he was an American writer who happened to write about Jews, and in so doing declared his autonomy and freedom from any collective responsibility. But his voice, his cadence, his tone, his characters are so deeply Jewish that when I first read him as an adult – starting with “The Counterlife,” before moving on to “Sabbath’s Theater,” “American Pastoral,” “Exit Ghost,” and so many others – I could finally hear my own voice, a Jewish voice, take shape. Rebecca Spence is a writer and editor at work on her first novel, “House of Ascension.” She was raised in Cambridge and currently lives in Taos, N.M.